I love what Silverjet and others are doing. The first opportunity I get, I'm getting myself on one of these jets. I'm begging you guys - get a service to San Francisco pronto. And for that matter - into the Asian markets. Yeah! This is something I've been trumpeting for years. It's time agencies threw out timesheets and focused on the value they bring to their clients. You don't measure value in minutes or buckets of clips, but rather in terms of ideas. Crispin Porter & Bogusky's bold deal with Haggar, struck last year, in which the agency took an equity stake as part of its compensation, stood out as a rare exception from the sad status quo of agencies selling ideas as if they were pork bellies to be traded by the ton. "We're in the intellectual-property business," Crispin's Jeff Hicks said at the time. "We don't sell time." Ok, I get the value of time sheets in terms of measuring productivity and time spent on a clients business. But why over-emphasize it? Why not focus your talent on what really matters - Ideas! Agencies' moves into content creation -- such as Bartle Bogle Hegarty, New York's co-production last year of an MTV special that's set to become a TV show -- is another factor for rethinking traditional labor-based compensation models. Agencies might share syndication revenue or retain rights to creative content. When Crispin created a video game for Burger King, it was paid a fee in addition to what it is paid to create advertising, one executive said, although the agency does not receive a percentage of sales. Update: My wife and Jesse inspired me to add to this post. I bounced this off my wife last night and she made a very good point. What about all the tactical work that goes on inside a communications agency? Like it or not, lots of work that agencies do relates to block-and-tackle communications and not just the big idea. How do we charge for that? In this respect, counting the hours might make more sense. So perhaps what we need is an overlay - where agencies can build and participate in the upside of idea generation (and by default the downside). Reflecting on this, perhaps what we need is more blended models rather than the one-size-fits-all model of today. I believe today's model kills "ideation" as an activity by confining it to the scope of billable hours. It also has the effect of nuking what I call "idea entrepreneurship" - the creation of ideas that transform business models and models. Central to the tenet of "idea entrepreneurship" is that agencies co-invest with clients - they put up the hours and nouse, the client contributes products, services etc. The only agency I know of that is doing this today is Arnell Group. 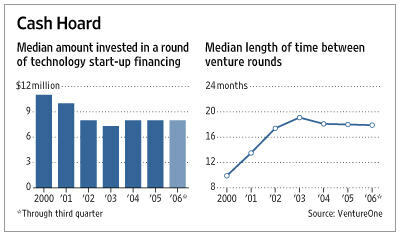 Measurement gets easy in when "idea entrepreneurship" is at play. Great ideas = Great dollars. It's time we heard this said of NZ's start-ups! Several organizers noted that Silicon Valley's original success as an innovation center was largely because of business and social networks developed over several decades in a community of venture capitalists and technologists. "The epicenter was Silicon Valley, but that has created a wave of innovation that has now reached the entire world," said Yossi Vardi, an Israeli entrepreneur and investor who financed his son's development of ICQ, an early Internet chat program later sold to America Online. Like many participants here, Zennstrom voiced the opinion that Internet-based commerce would accelerate in its disruptive effect on traditional businesses. Skype, for example, now says that it carries 4.4 percent of all worldwide long-distance calling. Some comments from me on what Kiwi's can do to drive their start-ups to new levels. At the end of the day I believe that NZ's lifestyle is not a negative influence on entrepreneurship. In fact, it's an advantage as this post from Rod points out. We need a deeper shift in thinking and approaches to occur. I also don't think that this should be viewed in a negative light but rather as part of the natural evolution of entrepreneurship in NZ. I haven't met a great entrepreneur that doesn't think they could be working harder or smarter. I've met plenty of Ok entrepreneurs with lots of reasons why they didn't go the extra mile. New Zealand's lifestyle is a competitive advantage. New Zealand entrepreneurs should revel in it and use it to attract talent. What we shouldn't do is confuse working long hours with productivity and output. While there is no short-cut to building great companies, they do require a combination of working hard and working smart. Platitudes aside, it's the smarts we have to build. Plenty of Kiwis are willing to work hard. We also need a shift in the DNA that can only come from experience and role models. As new bars for creating value get set, a new generation of Kiwis will rise to that bar. Look at what we have seen in the past few years with Aftermail, 42 Below, TradeMe and Endance. These entrepreneurs will excite and inspire more to follow in their steps. Longer-term we need to get more entreprenurial training and skills into our Education system. And that Education system needs to encourage students in disciplines like engineering, sciences and software development. If we don't do that we will face a worsening skills shortage that can't easily be corrected through immigration policies. New Zealand is at a really exciting juncture. The Internet is a terrific leveler, getting about the planet has never been easier, and new models and standards for entrepreneurship are emerging in New Zealand. There is lots to be positive and excited about. Ideas are paramount. Too much time is spent on where to communicate, not enough on what to talk about. Ideas can be gathered by listening to stakeholders and consumers online. Yes! As much as I love the science of communications and marketing, we shouldn't ever forget that first and foremost we are a creative profession! The new sweet spot for video content is a 3-4 minute segment, between long form (movie) and short form (30 second spot). This is the average length of segments on YouTube. Can't wait till all corporate pitches conform to the same format - like Demo! There is further proof of Linda Stone’s adage, "The World of Continuous Partial Attention". Thirty eight percent of those watching the Oscars on TV were also on-line. People may be watching TV but are watching TV differently. There is a clear impression among NZ entrepreneurs that Silicon Valley-based start-ups get big cash from VCs and spend like crazy. Reality couldn't be more different. The WSJ this morning throws light on prevailing the "thrift" is good mentality. "Cash is queen these days," says Mr. Thomas, who estimates Sharpcast can last another two years even if it doesn't produce any revenue. "Fiscal discipline is harder to teach later in the life of a company, and we want to be the last guy standing." "Indeed, while tech start-ups are raising less funding these days -- an average of $8 million each time, down from $11 million in 2000 -- they are making the money last longer. According to research firm VentureOne, tech start-ups in Silicon Valley now survive an average of 17 months on a single round of funding before needing to raise more money, up from just 10 months in 2000. (VentureOne is a unit of Dow Jones & Co., publisher of this newspaper.)" They are paid to post on a blog other than their own. They then become a freelance writer, journalist, hack, whatever you want to call them. The move by CNet and others to pay bloggers based on page views is no different than previous payment terms - such as words or stories - made to journalists, so, why call bloggers anything other than that? All that has changed is that the payment is more aligned with the reader/viewers interest level. Further, the move is likely to continue to blur the lines between the independent publication and there so called independent bloggers. Take Information Week whose vendor blogger blogs away in a very self interested fashion only then to be named by the same publication as "one to watch" in the coming year in a full page spread. Self serving? Self interested? Biased? Yep - all of the above. And not an ounce of disclosure or transparency by either party. As Steve suggests, this should raise an eyebrow - more than an eyebrow. But is very different than bloggers pimping products in post. It is far more subtle than that. "at ZD Net bloggers are compensated based on the number of page views they receive and a fraction of the pages in TalkBack, so at the end of the month the size of a check expresses something, but not necessarily our success in being informative or accurate." I do think though that publications are attaching the mantle of blogger to paid writers and thereby opting out of any sense of integrity that applies to the masthead. Mitch is making an equally important but different point that popularity doesn't correlate to accuracy - anywhere. This has been going on for sometime, and pointed to by Tom Formenski and others - so Steve's revelation isn't so much that as a rehash. Either way, it's worth flagging as the standards we expect of publications are increasingly compromised and new means of bloggers generating revenue come to fruition. Nick makes a good point that businesses and workers tailor what they do in response to economic incentives - a shift in the way publishers and journalists make money means a shift in what gets published. But the message also makes the medium. And once fiercely independent online media are being transformed. Cool site promoting NZ. Like the PR stunt with the Silver Fern! Screen size. I'm one of those weird people that watch videos on their iPod - normally while working out. The bigger screen and format mean more viewing and one less device. OSX. One less interface to learn. One platform to love. One platform for all my apps. WiFi. I live on WiFi. This is a real coup for them. Cingular made Nokia take the WiFi out of the E61 and rendered it useless. Camera. Finally, one device for everything. The other big news that Office 2008 will be ready for the Mac next year and, I hear, Parallels will run Windows apps inside OSX (you don't have to switch between OSs) means I am back on a Mac full-time by December. Brilliant! One thing I love about Apple is that they just seem to care about their customers. Contrast this to my recent experience on the Microsoft Office 2007 beta and trial and Apple wins hands-down. They seem to just revel in what they are - a product company. Rod, I'll be standing in line to get you one mate!